Is Freedman going to Felder this? I can't believe I'm hearing Rush on WFMU. Rush never played MY Junior High. oh god isn't that enough scott? I've never heard of Rush. Is this record playing at the right speed? Ah, right. His voice will probably change in 8th grade. Nah, Geddy's voice never did change after 7th grade. Lee was 21 or so. PEACE all. Scott, it takes a lot of BALLS to play this. Good on you! It really rocks, un-ironically. Rush!! Yeah! Scott is one of the few Rush fans of WFMU...along with Clay! Kind of dig this garage-ier version of their sound. Oddly, I don't feel like working right now at all! You have a point. One day he'll right a song about a girl...and his voice will change. I have a friend of mine in Toronto that would go bonkers if he heard this (I'm just just boinging in my head). They were still a bar rock band at this point. Mythology and Ayn Rand material would follow later on. Was in a record store yesterday. Proprietor played live Weather Report, a Jaco solo track. We were enjoying it, but we sensed something amiss. Oops. The 33 1/3 was spinning at 45! "Jaco could play that fast and accurately. We hardly noticed," says the proprietor. Rush played EVERY high school in Southern Ontario in the early days. Time Stand Still opens with a vid from The Capital in 1976, during the 2112 Tour..I was at that show! I wanna get this first Rush album. Wow (again)! Tupelo, Mississippi via Birmingham, UK. This is gonna be one hell of a show! no one has anything to say about Elvis Sabbath, though?!! Suspicious Minds / Sweet Leaf mash-up perhaps? Cool, maybe Scott can play some King Crimson from 1974? a friend told me i should check out the first rush album before i say anything else about rush. i figured they must've been purely instrumental at that point, but no. The Rush documentary is really good. that jam was pretty hot. maybe some computer genius will invent an "app" that takes the vocals out. Best Rush? Any of Budgie's albums? Orgone kills. I saw them open for Galactic once. why, there's one tonight at 8, Andrew! Yep, and Stashu's got Jimmy Sturr on the show tonight! I heard that, will be fun. Ahhh! I missed Rush!!! Ahhhh Akkkk Aaaasllaaassss! @Ken, don't let the venerable Mr. Clay Pigeon near any of 'em! @-Ken: Some of the WFMU chairs need to be upgraded. Or sidegraded. I dunno. I hope Pseu and whoever ordered them are mensches. @Rob (Jerzcity): You beat me to it!!!! People are always surprised when I know who Jimmy Sturges is. I can't catch Stashu's show tonight, but I'm going to have to look for the archive. First Rush album is basically Canadian LED Zeppelin. Listened to Caress of Steel for the first time fully ever this weekend. @-Ken - I was totally joking with my comment on Clay's board this morning. I mentioned a pallet of chairs on the loading dock, but it was meant in fun; chairs for Clay to throw. For years after seeing LCD Soundsystem open for the Rapture, I kept asking my friends, "who was that band with the cowbell? LED Soundsystem or something?" - is Grace Jones still around ? Every time someone points out Iggy Pop is still alive, an angel gets its wings! Jake, I thought that was every time Iggy puts on a shirt. I wonder if you can buy a carbonated beverage Iggy Pop somewhere in the midwest? @Jake: I had a huge poster of that pic of Rush in the white outfits in my dorm room. Stylin fer sure. I'm fascinated by bands with so many line-up changes that at some point they contain NO original members. "In Japan, Shinto shrines are rebuilt every twenty years with entirely "new wood". The continuity over the centuries is spiritual and comes from the source of the wood"
I think at some point TSOL had no original members and when all the original members regrouped they were not legally allowed to use their own name! Though I might be imagining this. I don't know Jake, James Murphy comes off as mostly sincere. And even I don't like everything he does, he has put out some bangers. Honky Tonk Becky has played Sons of the Pioneers, a band that's been around since 1933. Imagine their turnover! out on the road, alright! Happy still Monday morning to those in Hawaii and the Pacific! @steveo: Hoof 'N Mouth song idea, mayhaps?? Yeah, Listener Bob, that happened with TSOL. @steveo, damn I never heard that before! @steveo: thanks for that link. I didn't consider the philosophical implications of this. Fascinating! I didn't know about Shinto shrines being rebuilt. I immediately thought of the grandfather's axe idea. @northguineahills: “I don't know Jake, James Murphy comes off as mostly sincere.” I sincerely think I could trust lending a power drill to James Murphy, but I find LCD Soundsystem to sincerely be not good. @Bob: Or the "Ship of Theseus" paradox as the Greeks called it. Another part of rebuilding Shinto shrines is the wood always comes from the same forest/grove of trees. It's like a snapshot of something that was alive, in every generation! If all the cells in our bodies die and get replaced (every 7 years is usually the time frame suggested) are we really the same person at that point? dang! Missed th'Mamuthones! Punching self innaface! Good bossa jazz. Muito estimado. I'm treating my flu addled head to hot water with rum and lemon. This off kilter Bossa sounds like the inside of my head right now. I call The Who, The Two! Iggy Pop contains no original members. When a radio station changes its format and replaces all the DJs with automated programming, is it still a radio station? "The Discontinuous Life of Ronnie Wood"
Can we hear The Witch by The Rattles? @bob "a vast majority of neurons composing the neocortex were formed before birth and persist without replacement"
@Ken HP: Eventually that will lead to the death of commercial radio--no one will listen to such a station, but it will still be broadcasting, and advertisers will still pay for commercials--on the off chance that the signals will penetrate our brains and influence spending habits. you cut it off right before the drum solo! Re: The Rattles. That's a great track, Uncle Michael. Have you heard that compilation DJ Goatface Killah Presents: Ave Satanas? It's all late 60s/early 70s witch/devil/boogeyman related songs. It's really tastefully curated for a comp. of The Devil's Music. different types of cells regenerate at different rates, but there does come a point when you no longer have any of the cells you had at some prior time. but which cells hold my soul? I'll retreat into my "cell" to examine this--at least my original interest has divided and expanded into some larger form of interest! oh, those are your "soul cells", sometimes referred to as your "Edwin Starr cells"
Does the boy rule the mind? Or the mind rule the body? I dunno. *Body, so much for the Smiths joke. The "Choir" as an entity is the same, yet the members are multiple, and switched whenever. Kind of like Brigham Young and his theories on marriage.. I still vividly remember the first time I heard Joe Frank on the radio. i do not, though i may have recorded it, and would still have the tape. well, i have to take back what i said about the osmonds. they're all still alive. Rich. I have not heard that comp. i knew all the monty python records by heart before the tv show came to the us. i was quite disappointed when i first saw the show. As the guy who does Radiolab, I think it is, just observed: Joe sounds like he's coming from inside your head...like Tolkien didn't say he created things, but researched them from the collective unconscious...really - Joe is Definitive. after the pythons came to channel 13 my older brother got into it. it became something we did together,besides fight. it was on past out bedtime though. somehow my brother convinced our parents that it was art and a good culture-building program - along with the animation festival program that followed it; so we got to stay up pretty late once a week. Two schools on what keeps a band legit despite defections of members. One I've always heard is there has to be a thread that somebody has to played with somebody who played with and so own with an original member. That allows a complete changeover but with a theoretical link with the past. However, it seems the new Grassroots are so bad some regions demand the presence of an original member. I think that might wipe out half the groups touring today. Yes. Engineered by Dieter Dierks, includes at least one person associated with early period Passport. Go for the Tiger B. Smith, @dale. geezerette will see that I previously made a similar statement (due my Faber clicky star earlier). Scott, especially love this set! coelacanth - and sometimes you got to see carol cleveland's front parts. NGH, we have magnificent taste. haha dale the naughty bits?! i've never had success buying with the intent of reselling - and i don't love that music enough to get stuck with it. Coel, yeah, we would watch Python/Second City/SNL back to back. Some microtonal Tenney is good! get well soon, gz'ette !! @RRN63: Ironically there's less government funding for PBS than in their psychedelic days, yet it's gotten more bureaucratic, risk-averse, keep everything nice and steady for their Viking cruise sponsors and target audience--nowadays you'd need an Internet platform or something like WFMU for something truly independent and mind-blowing. Wait, this is a James Tenney piece, Holy heaths! "BUT IT'S MY ONLY LINE!!!" i only vaguely remember second city...and mary hartman!mary hartman! but for a little while there was "the animation film festival". 1/2 an hour of usually bizarre and always excellent animated shorts from all countries. i may have liked it more than the pythons. anyone else join the women's marches this weekend? Like @coelacanth∅, I also knew Python from their records long before they were available in Connecticut. I think the prevalence of Python in the house helped get it on Connecticut Public TV, where my father was on the board. Now my daughter is a Python head. Fortunately, I have a copy of "All The Words". i did pick up a clean working onkyo receiver for 20 bucks. i can pair it with the five dollar sony bookshelf speakers i got last summer and listen to fmu in style. i always get distracted and have to listen to this program in the archive. cripes. Yes, I'm going to Go There: That was a very interesting take on Garcia's playing in that Black Peter. I didn't recognize the song until the very end, but I sure as hell recognized the guitar work. I liked those PBS showcases of quirky animations as well. MTV used to run stuff like that as well (and it's little cousin Comedy Central). We have the Internet to search for Don Hertzfeldt and crazy Italian cartoons about death, but I still wish someone was a star "compiler" of these, so we can seek out the stuff more easily. Jaap Blonk is coming to the West Coast in April, including a lecture here near campus. I feel for Judy Woodruff. PBS stands for Private Broadcasting Standards. I get to be extra cranky cause I've got the flew. 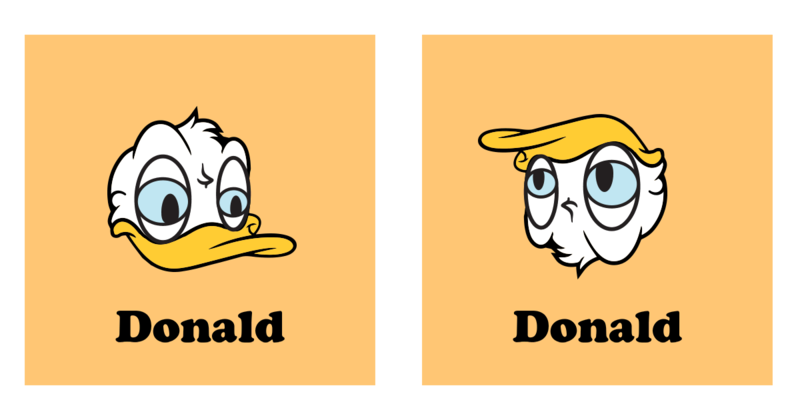 i'm sorry donald, er i mean geez! i hope you're well soon. @geezerette: I always thought it was Fred (the one not w/ the family business) that donated most of the money to PBS (and the Lincoln Center), but apparently David does as well (he did fund the Lincoln Center fountains), so, now I'm having trouble keeping track which 'philanthropy' is toxic. Thanks Scott! The surreal music helps! I acually sound like my avatar now! NGH, David Koch's name is prominent in credits for Nova and many shows concerning the environment. It's really sad. There's always a Disneyesque cheerfulness about biodiversity but never a mention of threat or extinction. lovely thing, that Die Angel. What are the Evil Kochs up to now? We especially despise them here in WI. Oh, wasn't that great!? Would love to have visited. Ideas and wealth are almost inverse, like the life instinct vs. the death drive. The only ideas "living" are those creative and free (and unattached). Wealth brings comfort, but is "weighed down", dead and closed (like an Egyptian tomb). You can be creative all you want, but how far will that take you before you have to deal with money. And supposing you get addicted to that! But if addiction is mostly mental, perhaps there is still a way to free your mind from all the evils (including wealth) and experience all the light life has to offer. Don't know if it will happen in my lifetime, but I hope it can happen. This would be the same Brain that toured with Cluster for that first USA jaunt in the mid 1990s, i believe? @ βrian: the latest with the Koch-heads: $500K donation to Ryan the day after the tax cuts were passed. Oh, that was them? Oy. Anyways, @RRN63: Banksy's "Dismaland" aside all this human hubris has GOT to be great material for aliens writing trilogy epics on Earth. Cheers, Matt! Stay creative, enjoy others creativity. Everyone here is lucky! We have Scott, all the other DJs, our imaginations...lucky! Die Angel: is that, like, "Dye, Angel!! ", or "Dee Angel"? NH: "Live free or The!" I heard Python bits performed by a precocious child a couple years younger than I before I even knew they existed. It was this feeling of envy and wanting to hurt him. @RRN: You're in NH? I used to live on the other side of the Yin-Yang divide, in VT.
@flash: Why is it others always want to hurt us Python fans?? Even though a friend and I were obnoxiously chanting "Eric the Half a Bee" on a car trip, with the INTENT of getting another friend to fight us (boys have strange ways of bonding, yes). @βrian: Cool. Vice-versa that for RevRab. (A former "Springfielder" in Vermont, IIRC). @Andrew S ~ no, i'm not the witch either. though i have been. how dare i forget what a saving grace good music is. for shame! I want a funk or fight battle between The Brides of Funkenstein and Parlet. We always hand out "Python Planks" at our social gatherings. Visitors must bring their own monastic robe, though. Joe McG has resolved at times to play proper tributes to people, before they go! I think he did such a set for John Cale a while back. Comment by Danne D @6:39 p.m.
wonderful. aren't those usually for birthdays? they're all pre-butes really, aren't they..
@RRN63: HA! I was a full-on Python freak when I was a kid and begged my mom to drive me all the way out where Holy Grail was screening in a real live theater - and the sights and sounds of all the adult Python fans yammering away at once really had quite an effect on me. Still love Python, but fandom can be really ugly. Ah ha! Thanks Dean and RRN63 for connecting! I am saddened however, that I now longer have instant access to all of the Monty Python episodes and movies now that streaming channel Seeso has ceased-o. i'm surprised, Rich! they're really nowhere? The DJs who say Ni! I aspire to be a drunken foreigner band (their set on Rob Weisberg a few weeks back killed). i haven't seen a python skit in decades, and haven't heard those records, except for a few bits on fmu, since i "broke up" with my friend George when i was 11.
i think our gov't. has white guy disease. i suspect the only cure is repeated white-guy-ectomies until all decay is removed. but this is a great track! Rev Rabbit, doing all that is holy for all of humankind. @chris ~ alas, it' seems white guy disease isn't restricted to the white guys. complete excise will be difficult. it's most effectively accomplished by the person in question & who'd submit to that on purpose? LL: Seeso was a paid streaming channel that had all the python stuff, all the Alan Partridge series, almost any really good britcom you could imagine. Then it died. I think the only way to get the episodes in their entirety (legitimately, I mean) is iTunes. i like Michael's idea! worth a try! did i just see something about their youtube channel? have you looked at that? wasn't the rainbow gawd's promise to not kill us all again ? usurped by the human death-drive, i'm afraid ..
@coel: resemble that remark (most nothing but English and Scottish protestants in my background. I'm as WASP as it gets (w/o coming from money). I wonder what an archivist would make of these playlist comments 20 years from now. i have the full set of monty python's flying circus - on vhs. almost 6, the spelling/grammar part of my brain stopped. RR ~ everyone knows the antiwomen basically believe the woman is only an accessory to the process. will THAT ever ave a resurgence? Too bad about Seeso, I wanted to check out some Alan Partridge. @Linda: Narcissist component to that probably - "the male is better, because that's what I AM!" one benefit of a rainbow of women is that, as there would be a pot of gold at the end of it, even the most machievelian (sp) of the slime that's in charge now would jump on board with the rainbow women's ideas just to try to get at that gold. that should keep 'em busy for...well, forever. thanks, Scott! great show today, sir! from way back, that one. comes with the patriarchal territory. I used to be able to do the entire Mr. Smoke-Too-Much Travel Rant monologue ... with all the sections that were in "The Monty Python Papperbok". ngh i'm pretty anglo my damn self...i was playing on a post you (i believe) made earlier! see, learning by rote does work! When the thanks bubble up, you know the cleaver is about to fall .... so, thanks. Alan Partridge was great. If you like Steve Coogan Tristram Shandy was just briliiant "film within a film", right from the start where he is comparing the colour of ron brydens teeth to a "pub ceiling"
Thanks Scott for the great show! Linda Lee! Hello / Goodbye! no cleaver tonight .. just a scene shift! Belayed hi and thanks Scott! Great show!